POCOLA, OK (July 19th-21st, 2018) – The 20th Annual Super Stock Showdown and John Stand Memorial kicked of at the mighty Tri-State Speedway on Thursday night, July 19th, 2018. Thursday night practice cars were met with temps in the mid 90’s. Friday night fans and Super Stocks faced 108-degree temps. Saturday night, July 21st, there was a “cold front” that moved through and dropped the temps down to 100 degrees at race time. Due to the excessive heat the start time was moved later in the evening. The track prep crew worked their magic, even with 100+ degree temps, with a fast, wide and smooth racing surface for both nights of racing action. The pre-race ceremonies started at 8:30 PM, on Friday night, with the invocation along with two #6 cars to honor the late John Stand who presented the American flag during the national anthem. Saturday night’s pre-race ceremonies started at 8:10 PM with the invocation. During the national anthem, three #6 cars paced the memorial parade lap, with other cars following. The #6 being symbolic as the late John Stand drove car #6. Leading the parade lap on Saturday night were Susan Stand (#6), Jeff Metcalf (#6) and Jack Kirby (#6). Heat races were determined by the driver’s draw at sign in on both nights. The classes advanced to their features, during this event, via passing points earned in their heat races. At intermission, each night, everyone grabbed themselves some food items from the concessions along with an ice-cold Pepsi product. A few drivers received previous week’s trophies during intermission, on Saturday night, while Burl Woods (135 – Republic, MO) threw T-shirts into the stands. Fans could also buy their chances to win the race-ready Super Stock that will be given away at the end of the race season. 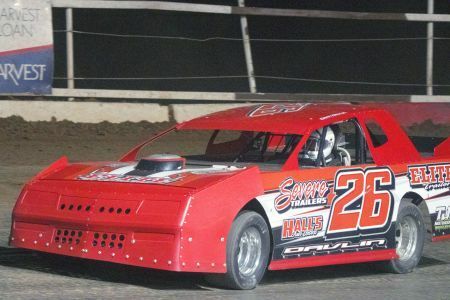 Friday night saw heat racing action for the Super Stocks as well as two qualifying features that were lined up from heat passing points. Feature one saw Kevin Salter (23 – Batesville, AR) take home the win over Gean Davlin (26 – Shady Point, OK) and Grant Davis (1 – Muldrow, OK). The second feature was won by Neil Johnson (17 – Fort Smith, AR) as Danny Womack (3 – Bixby, OK) and Kyle Slader (19S – Muskogee, OK) finished in second and third. The top six cars from each qualifying feature, from their finishing positions, locked into Saturday night’s $5,000+ to win A Feature. The NexGen drivers, along with the USRA Modifieds, had the weekend off. There is still time to get racing this season with your own NexGen car. The NexGen class is an entry-level, low-cost, no racing experience class. You can find the simple rules on our website, at www.Tri-StateSpeedway.com, under Driver Info and then Rules. Blaise Leatherman (94L – Muskogee, OK) is the current points leader. The first feature on Saturday night was the first of two last chance qualifying (LCQ) features for the Super Stocks. Feature one saw Dylan Davlin (26D – Shady Point, OK) take home the victory over Kris Lloyd (1X – Peach Orchard, AR) and Scooter Scruggs (43 – Hensley, AR). Feature two had Burl Woods (135 – Republic, MO) crossing the line first ahead of Richie Tosh (11 – Batesville, AR) and Jeff Metcalf (6 – Siloam Springs, AR). The next feature up was for the Out-Pace USRA B-Mod B Feature. Shawn Pinkerton (999 – Cedarville, AR) took home the win as Steve Butler (40 – Siloam Springs, AR) finished in second over Lonny Flanagan (7 – Rudy, AR). The first A Feature on the track was for the Factory Stocks where Andrew Bohanan (33 - Stigler, OK) took home his second win of the season. Wesley Bourne (5 – Cameron, OK) and Marshall Penson (1P – Van Buren, AR) finished in second and third. 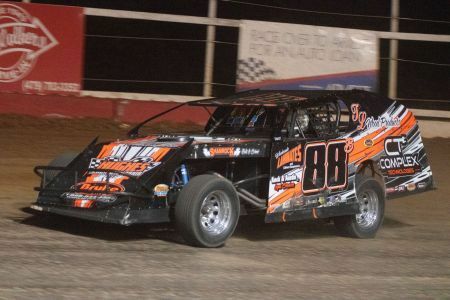 There was an anonymous sponsor "in memory of my dad" who paid a $175 Hard Charger bonus for the feature which was won by Jim Philpot (1S – Greenwood, AR). Philpot went from 19th to 4th, to pick up the award. Kyle Hamby (7 – Hackett, AR) sits atop the point standings with a 64-point advantage over Bourne. The big feature of the weekend was for the Super Stocks competing for $5,000+ to win in a $17,000+ purse. At the end of 50 laps, Gean Davlin (26 – Shady Point, OK) out-dueled his son, Dylan Davlin (26D – Shady Point, OK), for the win. 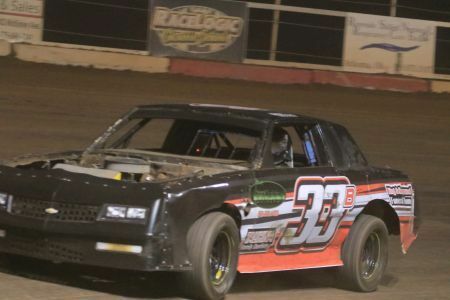 Eddie Martin (10-4 – Stillwell, OK) crossed the finish line in third place. The $500 hard charger award went Jared Hays (4 – Jonesboro, AR) who moved from 20th to 7th. Muskogee Powder Coating awarded the top ten finishers, as well as the top two non-qualifiers, a $500 gift certificate. Schoenfeld Headers $250 gift certificate went to Neil Johnston for his 6th place finish. Since this was a non-points race, the point standings remain the same as the previous week. The last A Feature was for the Out-Pace USRA B-Mod A Feature. Hunter Byers (88B - Rogers, AR) picked up his second win of the season. Brandon Wilson (4B – Fort Smith AR) and Dalton Ragsdale (22 – Muskogee, OK) finished second and third. The Temple of Zoom Motorsports $100 Hard Charger Award went to Todd Broyles (09 – Fayetteville, AR) who moved from 17th to 7th. Wilson takes over the point standings for the class with a 22-point lead over Tarkington. The next event for the mighty Tri-State Speedway will be the Annual Summertime Classic Factory Stock Special on August 3rd and 4th, 2018. Complete information will be published soon. Our annual Back to School event with free backpacks for the kids will be that weekend, as well.